with accretion disk and high-velocity jets. For the first time, astronomers have found a supernova explosion with properties similiar to a gamma-ray burst, but without seeing any gamma rays from it. The discovery, using the National Science Foundation's Very Large Array (VLA) radio telescope, promises, the scientists say, to point the way toward locating many more examples of these mysterious explosions. 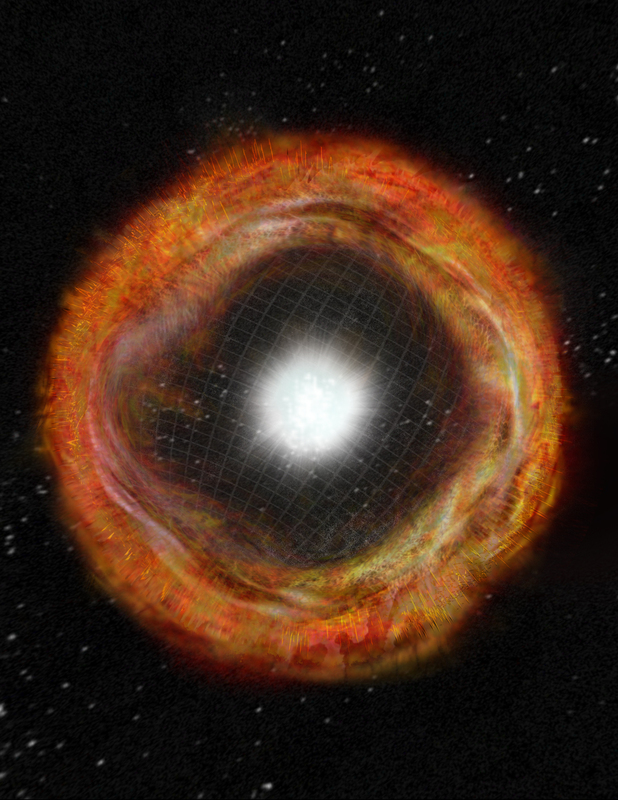 "We think that radio observations will soon be a more powerful tool for finding this kind of supernova in the nearby Universe than gamma-ray satellites," said Alicia Soderberg, of the Harvard-Smithsonian Center for Astrophysics. The telltale clue came when the radio observations showed material expelled from the supernova explosion, dubbed SN2009bb, at speeds approaching that of light. This characterized the supernova, first seen last March, as the type thought to produce one kind of gamma-ray burst. "It is remarkable that very low-energy radiation, radio waves, can signal a very high-energy event," said Roger Chevalier of the University of Virginia. When the nuclear fusion reactions at the cores of very massive stars no longer can provide the energy needed to hold the core up against the weight of the rest of the star, the core collapses catastrophically into a superdense neutron star or black hole. The rest of the star's material is blasted into space in a supernova explosion. 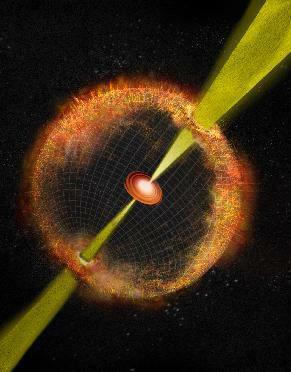 For the past decade or so, astronomers have identified one particular type of such a "core-collapse supernova" as the cause of one kind of gamma-ray burst. Not all supernovae of this type, however, produce gamma-ray bursts. "Only about one out of a hundred do this," according to Soderberg. In the more-common type of such a supernova, the explosion blasts the star's material outward in a roughly-spherical pattern at speeds that, while fast, are only about 3 percent of the speed of light. In the supernovae that produce gamma-ray bursts, some, but not all, of the ejected material is accelerated to nearly the speed of light. The superfast speeds in these rare blasts, astronomers say, are caused by an "engine" in the center of the supernova explosion that resembles a scaled-down version of a quasar. Material falling toward the core enters a swirling disk surrounding the new neutron star or black hole. This accretion disk produces jets of material boosted at tremendous speeds from the poles of the disk. "This is the only way we know that a supernova explosion could accelerate material to such speeds," Soderberg said. Until now, no such "engine-driven" supernova had been found any way other than by detecting gamma rays emitted by it. "Discovering such a supernova by observing its radio emission, rather than through gamma rays, is a breakthrough. With the new capabilities of the Expanded VLA coming soon, we believe we'll find more in the future through radio observations than with gamma-ray satellites," Soderberg said. Why didn't anyone see gamma rays from this explosion? "We know that the gamma-ray emission is beamed in such blasts, and this one may have been pointed away from Earth and thus not seen," Soderberg said. In that case, finding such blasts through radio observations will allow scientists to discover a much larger percentage of them in the future. "Another possibility," Soderberg adds, "is that the gamma rays were 'smothered' as they tried to escape the star. This is perhaps the more exciting possibility since it implies that we can find and identify engine-driven supernovae that lack detectable gamma rays and thus go unseen by gamma-ray satellites." One important question the scientists hope to answer is just what causes the difference between the "ordinary" and the "engine-driven" core-collapse supernovae. "There must be some rare physical property that separates the stars that produce the 'engine-driven' blasts from their more-normal cousins," Soderberg said. "We'd like to find out what that property is." One popular idea is that such stars have an unusually low concentration of elements heavier than hydrogen. However, Soderberg points out, that does not seem to be the case for this supernova. Soderberg and Chevalier worked with Alak Ray and Sayan Chakrabarti of the Tata Institute of Fundamental Research in India; Poonam Chandra of the Royal Military College of Canada; and a large group of collaborators at the Harvard-Smithsonian Center for Astrophysics. The scientists reported their findings in the January 28 issue of the journal Nature.